When I crunch into one of those freshly made plantain chips, also called banana chips, it is the heavenly smell of God’s own country that I inhale! I call them mystic food. Back home, all we had to do to eat fresh chips was to walk down to the roadside vendor, who sieved the hot chips right out of the gigantic pan of simmering coconut oil to a large container and pack them for dear customers. Every time my India visit would wind up in the last- minute purchase and packing of my suitcases with these yums to the brim. 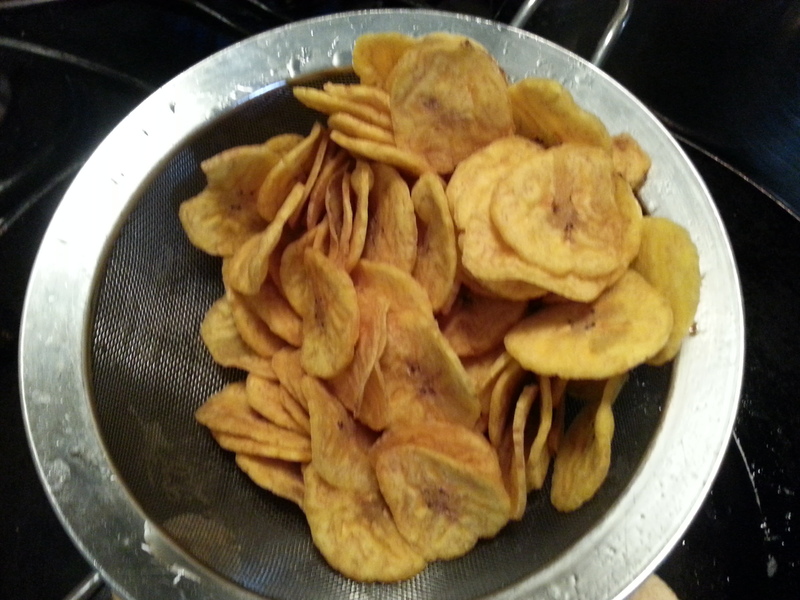 I had tried my hands on making these chips at home from fresh raw plantains bought at the local supermarket. My effort in recreating the original flavor here in US always fell short in terms of taste, texture or crispness. Whenever my brother visits, it is a ritual for us to make deep fried food, mostly puris(Indian deep fried bread) with potato gravy on Sunday mornings, which is a form of brother-sister bonding. But this time around, we strayed away from puris to plantain chips, reminiscent of ‘those’ times. He was also equipped with gadgets for precise slicing and coconut oil to add authentic flavor, knowing him for a perfectionist in his culinary indulgences. And man, didn’t it pay off this time? 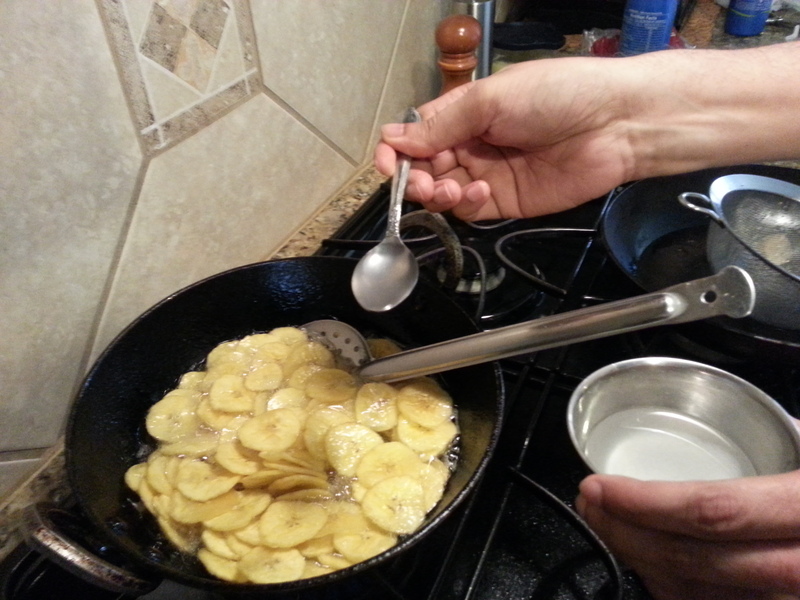 We got to taste near perfect plantain chips that my friend’s son was willing to pay $5.00 per lb for! 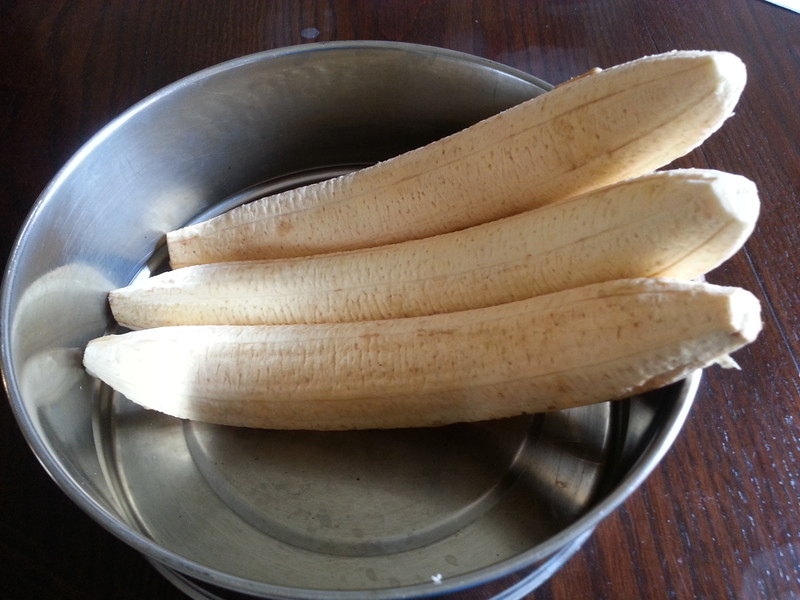 Wash the plantain, wipe them, cut the ends and make about 3 slits lengthwise on the peel. Make sure it doesn’t make its way into the flesh. 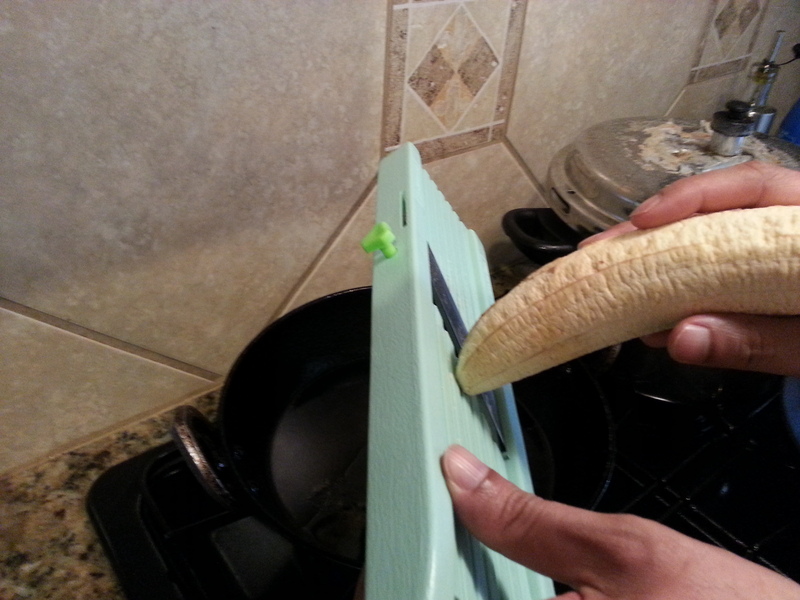 Put a knife in the slits and slowly peel the plantains. 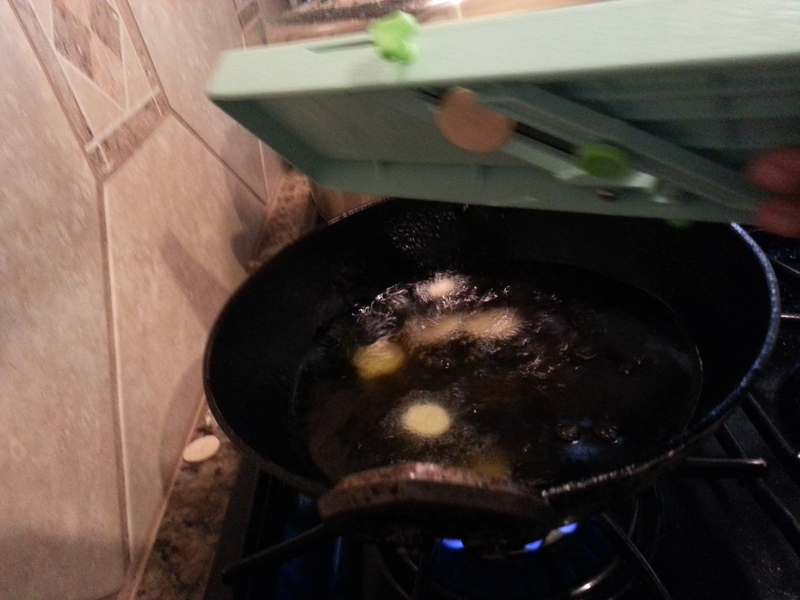 In a large pan, add the canola oil and coconut oil and turn on the heat. You can also make chips with just one kind of oil. We added coconut oil for flavor. Be careful while mixing. 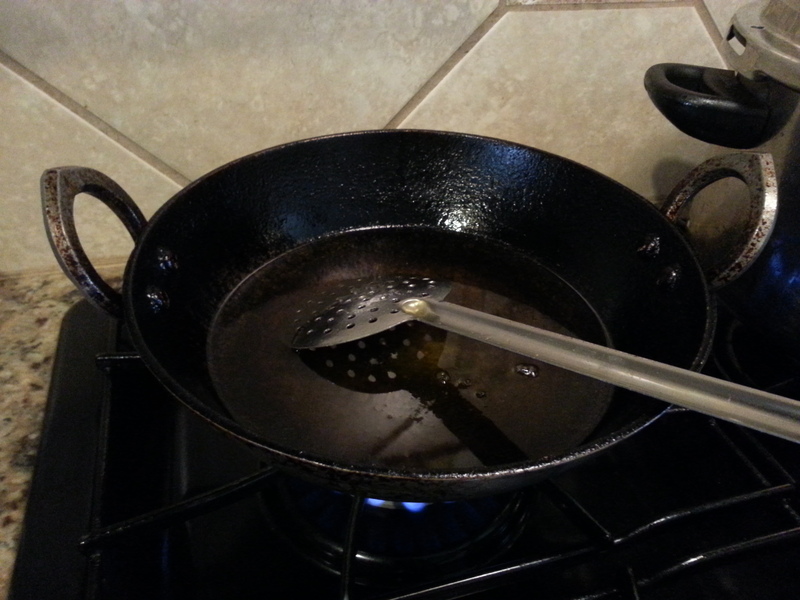 If you add more coconut oil the combination causes the oil to froth and come out of the pan. Once the oil heats, either slice the peeled plantain straight onto the oil or drop the pre-sliced plantain into the oil. 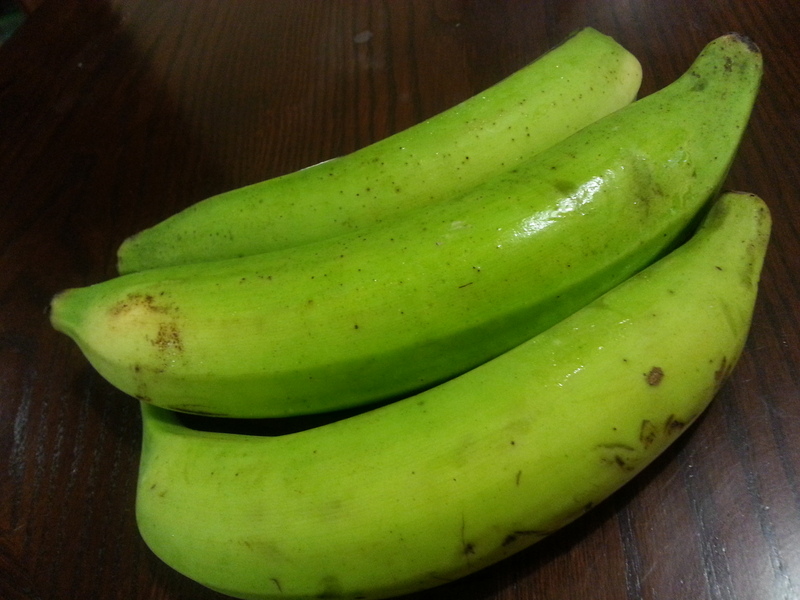 About 1/2 a plantain would suffice for one lot. Stir them occasionally keeping the flame at medium high. 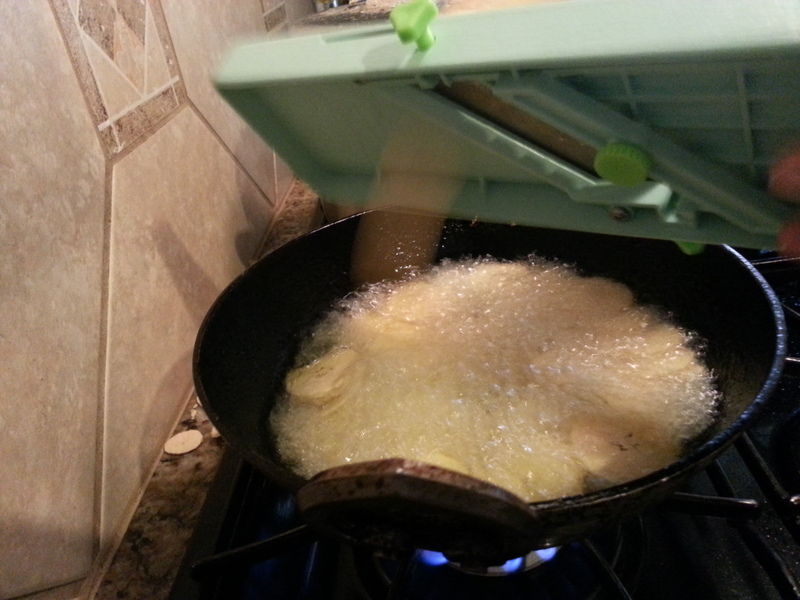 Once the plantain feels slightly crisp add 2 tsp of salt solution. It makes a wave like sound for few seconds. Do not be scared by it(If you are scared to add salt solution to oil, you can sprinkle salt once you take the chips off the pan, but this won’t be as tasty). Turn over the chips so the salt gets everywhere, reduce the flame and strain them onto a bowl lined with oil absorbent paper. Now the chips are ready to be consumed. Indulge yourself guilt free as they are homemade and there are no additives that you don’t know of, at least! After all, who doesn’t want to indulge in the guilty pleasure of deep fried delicacies every once in a while.